Northwest’s 400-strong Increasingly, too, many of the upswing’s He goes on to name ? ve U.S. design- might need to yield to other build mod- ? eet of vessels over 58 vessels will be of ef? cient U.S. design. ers which can compete with European els. Some European designers spread the burns were mandatory. The ? eet’s boats owners’ attention, but there are several “aggressively perusing new 2017 and risk of a build between themselves and a are so well-maintained, most of them, U.S. engineering ? rms that have (com- 2018” work of all types. consortium of partners, with the chosen that they’re still candidates for retro? ts of engines, holds, electrical systems and deck machinery. A sleek design from Skipsteknisk. the rounds and given weight to the idea that a major ? eet upgrade really is under- way. 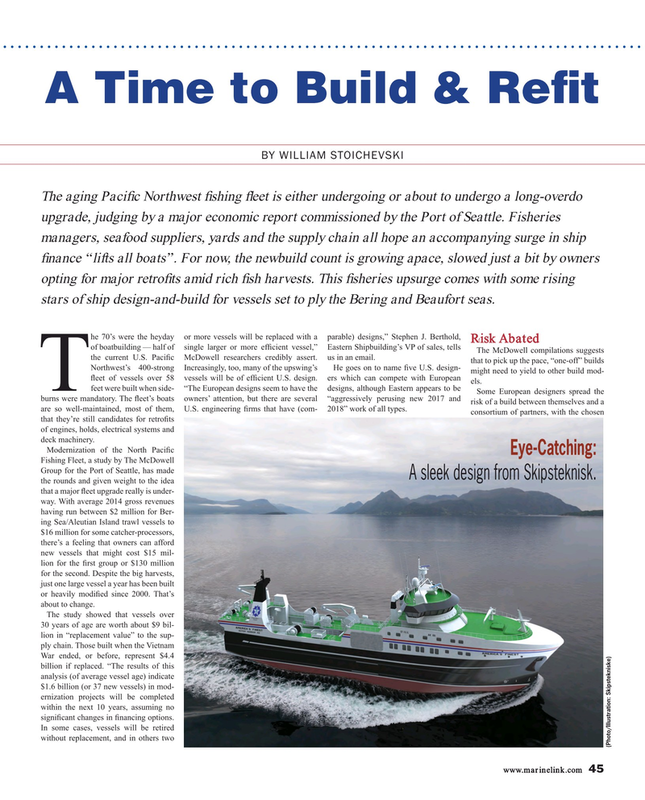 With average 2014 gross revenues having run between $2 million for Ber- ing Sea/Aleutian Island trawl vessels to $16 million for some catcher-processors, there’s a feeling that owners can afford new vessels that might cost $15 mil- lion for the ? rst group or $130 million for the second. Despite the big harvests, just one large vessel a year has been built or heavily modi? ed since 2000. That’s about to change. War ended, or before, represent $4.4 billion if replaced. “The results of this analysis (of average vessel age) indicate $1.6 billion (or 37 new vessels) in mod- ernization projects will be completed within the next 10 years, assuming no signi? cant changes in ? nancing options.